The impulse to manage conflict constructively goes back 40,000 years and spans 4,000 cultures and language groups. It runs parallel to our deepest destructive impulses. Across time and distance, biological necessity and social ingenuity have created artful political interventions in conflicts, among them, Hawaiian Hoâ€™oponopono, the Leopard Chief practices of central Africa, the Rabbinic interventions of Central Europe, Afghanistanâ€™s Loya Jirga procedures, the disentangling ceremonies of Melanesia, the peace pipe rituals of Native Americans, the Yoriai tradition of Japan, and the song contests of certain Eskimo peoples. Satellite Image of Papua New Guinea. Credit: Wikimedia Commons. The tribes of the Papua New Guinea highlands, for example, have a long history of aggression. Fights typically start over the same things all of us dispute about: interpersonal disagreements, religious and philosophical differences, dominion, and domain. The person who is good at preventing fights or settling them is called a â€œBig Man.â€� A respected and effective Big Man will use all kinds of clever devices to help the conflicting parties try and achieve a parity that ends the conflict and averts bloodshed. Women â€“- the â€œBig Merisâ€� -- have equivalent roles in their own circles. You might think of the Big Man as a â€œmugwump,â€� a term that dates back to the U.S. election of 1884. That was the year when a reform-minded faction of the Republican Party led by Theodore Roosevelt, Henry Cabot Lodge, and George Curtis refused to support the candidacy of James G. Blaine for the presidency. They strenuously objected to the political patronage tradition and the long running spoils system. Instead of lining up behind Blaine as they were expected to do, they formed a splinter group which came to be called the mugwumps. Their particular political heresy was supporting a more progressive Democratic candidate, Grover Cleveland, who won the election. 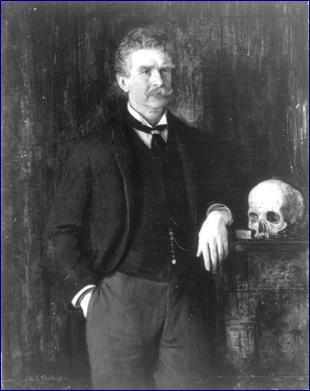 Ambrose Bierce: Himself a Mugwump. Credit: Wikimedia Commons. The most interesting part of the mugwump saga though belongs to the Puritan missionary John Eliot who used it in his translation of the Bible into Algonquian, a Native American language, in 1661 to convey the English words for â€œdukeâ€� and â€œcenturion.â€� Charles Dana, a 19th century journalist with the New York Sun, seems to have picked up on this. He was the one who popularized the term â€œmugwump,â€� also taking it from the Algonquian Indian word â€œmogkiompâ€� which means, among other things, â€œBig Man.â€� Today, the term is out of fashion, but still signifies a person who acts independently in political conflict. Mugwumpery requires a different way of thinking, behaving, and engaging. In their independent examination of the Iraq war, James Baker, Lee Hamilton and the other members of the Iraq Study Group became mugwumps for the Bush administration. Lucy Moore from Santa Fe is a mugwump. She brokers difficult meetings between Indian tribes and government agencies. So too are Paul Cosgrave, Sister Marilyn Ross, former U.S. Senator George Mitchell, and Michael Lewis. Paul helped put together a â€œLiquor Accordâ€� to combat chronic public drunkenness in one community in Sydney. Sister Marilyn of the Sisters of Mercy organized an improbable low-income housing coalition in Omaha. Former Senator George Mitchell helped forge the peace in Ireland. And Michael Lewis helped thousands of black farmers achieve negotiated settlements with the federal government. If you think you may have mugwump tendencies, take comfort from this: there are more of you around than you might think and you will continue to be one of humanityâ€™s best-kept secrets. 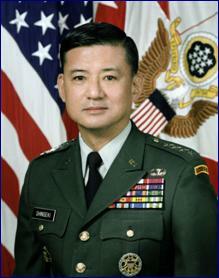 Eric Shinseki, 34th Chief of Staff, U.S. Army, Fired by Donald Rumsfeld. Credit: Wikimedia Commons. Conflict fuels change, change creates conflict, and politics is the transformer. The impetus to alter things and the countervailing drive to resist are in constant tension. Eric Shinseki, the former U.S. Army Chief who was fired by Defense Secretary Donald Rumsfeld when he disagreed with Rumsfeldâ€™s Iraq strategy, put it this way: â€œIf you donâ€™t like change, youâ€™re going to like irrelevance even less.â€� The political eye of the storm is a peculiar vantage point, a center to things, a calm place where turbulence waxes and wanes around you, where gales arise and dissipate, where pyrotechnics terrify and energize, where harm and possibility occur in the same instance, where matters circulate for a time, and then fade away. The eye of the storm is not for everyone. If you practice being there or find comfort in it, you can use it to good ends and enjoy the intimacy of being part of the exercise of power. If not, find some other line of work.